As daylight’s descent wanes, heading ever closer and begrudgingly toward the night, not wanting its place in the sky to end, the intrepid “band of merry media” and I — guest travel writers and photographers on an abbreviated Insight Vacations‘ Country Roads of Italy itinerary — resist the pull of the inevitable as well, as we wait along a three-step landing to begin, sadly, the very last activity of our eight-day journey: a gondola ride through the narrow side canals of Venice. Too bad this bittersweet moment has to center around the gondola, but the person, or persons, who crafted the itinerary for this media-only familiarization trip, placed it at the very end. Maybe the author of the travel doc is a romantic, or perhaps a sadist. I won’t ask, so we’ll never know. Gliding along in one of the most iconic symbols of La Serenissima, the gondola, in the right company and under a moonlit sky, is as romantic an excursion as you’ll ever experience, so I’ve been told. The company I’m with is fine, colleagues rather than lovers, at least as far as I can tell. We’re most interested in photographing every inch of this centuries-old, flat-bottom tradition instead of holding hands, exchanging glances and stealing kisses, although, a few of my fellow scribes are pucker-up worthy (names are being withheld to protect the innocent and/or embarrassed). If you’re looking to find romance pulsating from within the lines of this blog post about the gondola, Casanova’s preferred mode of transport, think again. The best I can offer is to refer you over to another, more famous travel writer: Samuel Langhorne Clemens, better known by his pen name, Mark Twain, the “father of American literature,” a great humorist and, on several occasions, a travel writer of sorts via a series of letters he wrote while in Europe. Like I said, I’m here to document the craft, the ride and the experience, not to provide narrative about on-board romantic interludes by lovers in love. After all, what unfolds on a gondola should remain on said gondola. Broken down into groups of six, the maximum amount of passengers permitted on a gondola, our band of merry media, now aboard the little flotilla of shiny, ebony-black craft, sets sail from the landing and glides down the first of several canals we’ll traverse, serenaded along the way by a Venetian accordion player. Stefano, our gondoliere (gondolier) — one of only 425 in the profession licensed by the City of Venice and a card-carrying member of the Gondoliers’ Guild — stands above and near the boat’s tail facing forward, balanced like a tightrope walker under the big top, and rows, one gentle stroke at a time. With the aid of his nearly four meters-long heavy demo (oar) that’s attached to the forcala (oar lock), which allows the oar to move in different directions and angles, Stefano maneuvers the stretch limo-on-water around traffic and through the narrowest rii and rielli (medium and small size canals) leaving a shadows-into-sunlight rippled trail behind in the quiet aqua blue water. 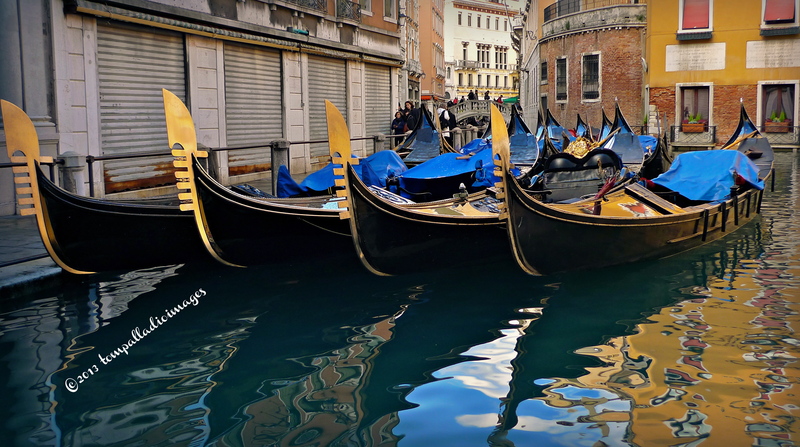 As you look around, you might ask yourself why are all the gondolas painted black? The answer is simple. 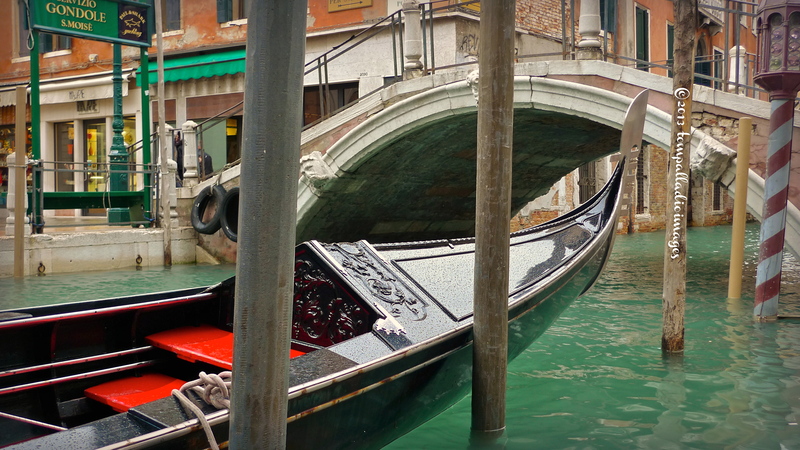 In the 16th century, the city fathers, in an effort to standardize the look and size of the banana-shaped water taxi moving to and fro, chose the color black because it was considered the color of elegance and not that of death — red was the color that symbolized mourning around Venice — and it covered over well the black pitch, or resin, used to seal and waterproof the gondola. 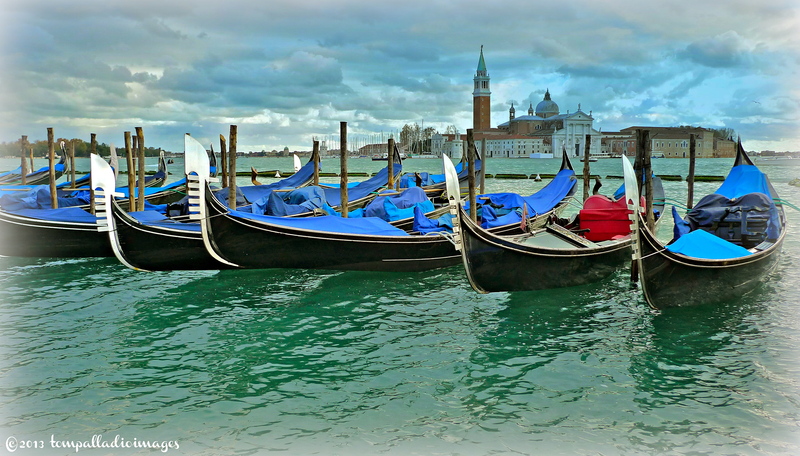 In their heyday, between the 17th and 18th centuries, gondolas navigating Venice’s waterways numbered nearly 10,000. Today, that number has dwindled to about 400, all devoted entirely to tourists looking for a hired ride to carry them around picture-postcard perfect Venezia. 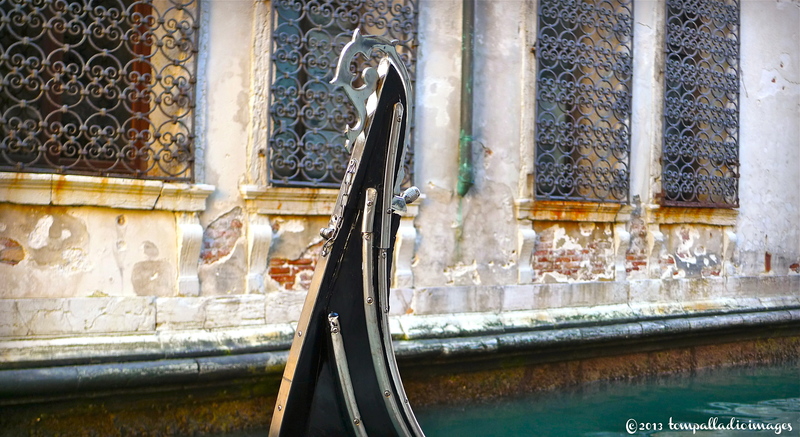 Gondolas, new ones handmade by expert craftsmen, cost somewhere in the neighborhood of $45,000 USD, and are composed of 280 pieces fabricated from eight different kinds of wood. Sans passengers and gondolier, the boat weighs around 350 kg, is 10.85 m long by 1.40 m wide. And, the left side of the craft, surprisingly, is a bit longer than the right side, to ensure that the gondola doesn’t favor moving to the left with every row stroke by the gondolier. 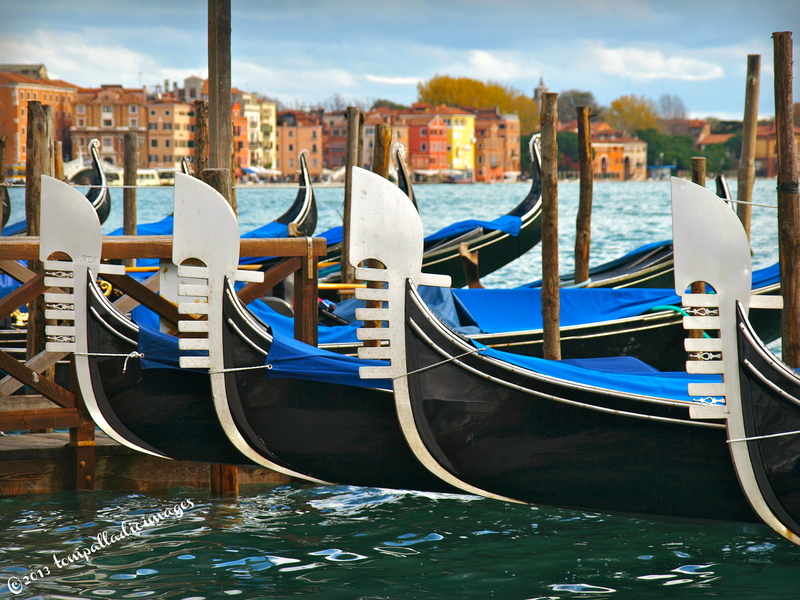 The ferro (iron), the distinctive ornamentation at the prow, the most forward part of the boat, serves as the gondola’s front bumper protecting it from everyday nicks and scratches and the occasional collision with other craft occupying the cramped, shared space. More than just a bumper, the ferro, next to the winged lion of St. Mark, is the most recognized symbol of the Most Serene Republic of Venice and describes in its design the City of Canals. The lone prong, pointing in the opposite direction of the other six, represents the island of Giudecca, just south of Venice’s main islands. The elegant curve at the top of the design represents the cap of the Doge, the leader of Venice and its most serene republic for almost 1,100 years. And, the semicircle, between the curve at the top and the prongs below it, represents Ponte Rialto (Rialto Bridge). 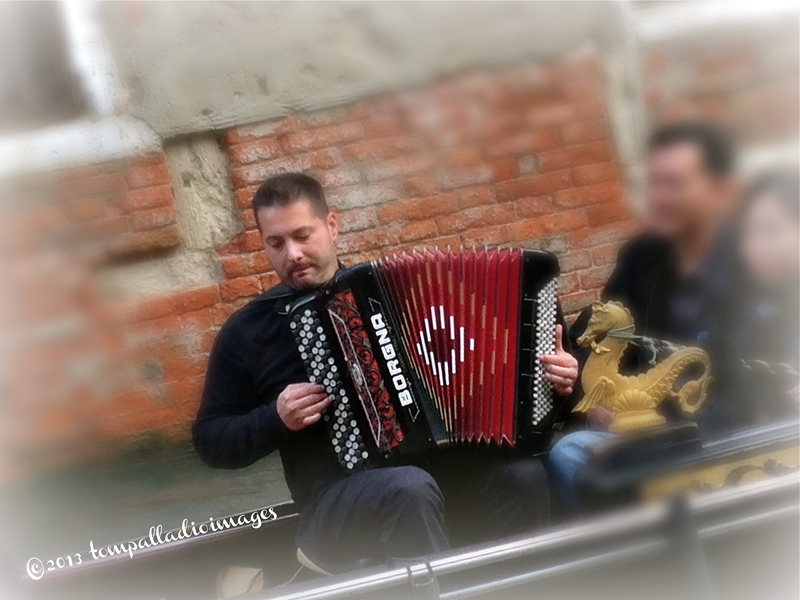 Close enough to touch the twilight-toned, weathered brick walls of the adjacent buildings that encase the route, we close our eyes as the accordion’s melody fills the air and imagine what it must have been like centuries ago to be in this very same spot, in a gondola on a scenic little riello (small canal) in majestic La Serenissima. 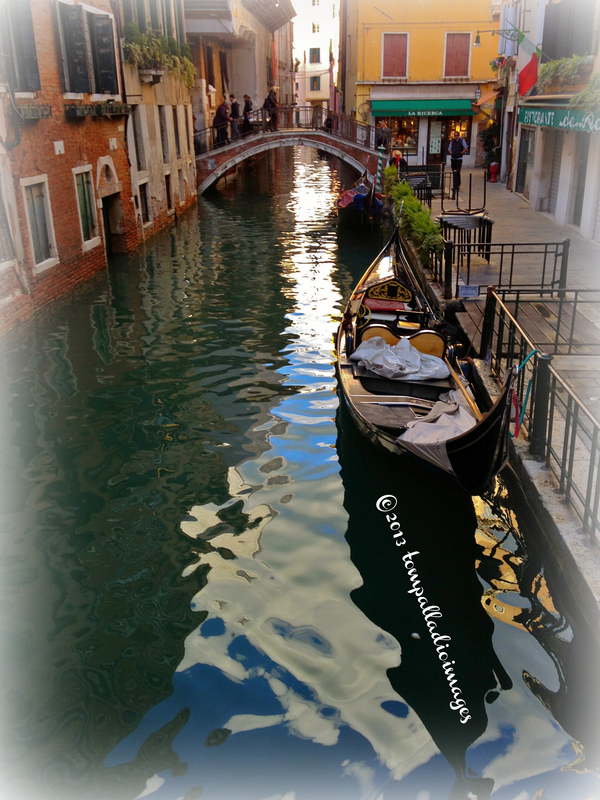 We wish this ride, and the watercolor-like visual and mental impressions it paints, would last forever, but it, as well as our eight-day, Country Roads of Italy journey, comes to a melancholic end as we quietly round the bend and glide into the Venetian sunset. For complete information on Insight Vacations‘ 12 Italian premium and luxury-escorted itineraries and over 100 journeys throughout Europe, just click HERE, or call toll-free (888) 680-1241, or contact your travel agent. It seems odd to me the choice of an accordion rather than a guitar – the latter being a more romantic sound if that’s what they’re promoting. Enjoyed the post and the trip. Jill — Austria left its mark on Venice when it ruled after the Doge and Napoleon, and gave the Venetians their first taste of the accordion. I guess they liked it as its quite popular there and elsewhere around Italy. 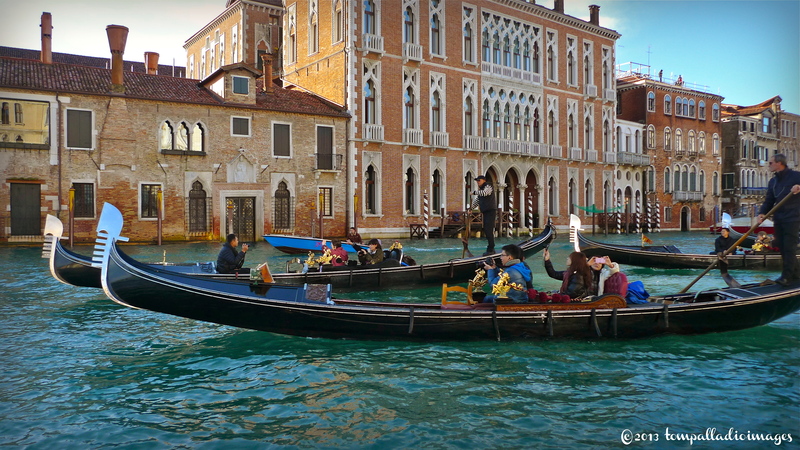 It’s played more often than a guitar by street musicians, including those onboard a gondola. Just the same, a guitar would probably work, too, just not as well with Italian folk songs of the Austro-Italo period around La Serenissima. 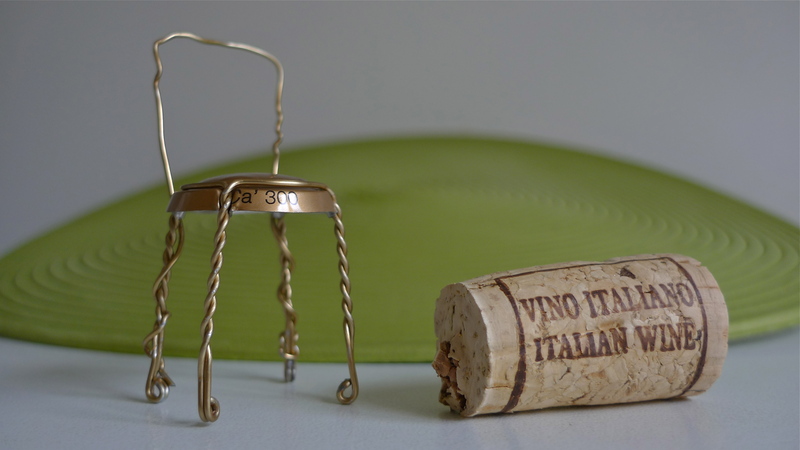 Aaaah…..molto bene. Grazie. I have learned something new. Lynne — And, it was nice having you along. Orna — 23 articles and I’m now toast. Have a great time up in Eire with tua famiglia. Civedremo Domenica alle 10.30-11.00. Thank you so much for sharing your wonderful experience. Each post was so well crafted with beautiful photos and a wealth of information. Nice work my friend, and again – great gig! Congrats. MG — Thanks for the high praise. Buon Natale e Buon Anno! A nostalgic revisit. Did this trip last year with the wonderful Caroline Pugsley as guide. Fantastic. Loved every minute and Caroline’s little extra moments of surprise. Helen — I don’t know Caroline, but Belinda, IV’s Tour Director of the Year, last year, was fab. Glad you enjoyed this short trip back down memory lane, that is, calle di Venezia.